In prior articles, Dr. Michael Kerr has given a detailed account of how spaced repetition is a great way to learn medical content. After his initial article, I started utilizing Anki, one of the spaced repetition platforms he listed, and was pleasantly surprised by how many in the medical profession were already using it. There were already so many pre-set medical flash cards that I didn’t even have to make. When I give lectures on apps for medical students and residents, I often times ask how many in the audience are utilizing spaced repetition apps, and usually at least a third of the audience will raise their hands. For those not well versed in using spaced repetition flashcards — it’s basically a way to learn using spaced reminders as you forget content. You first memorize, and then you get reminders to view key flashcards as your knowledge decays, blunting the forgetting curve. For those of us in medicine who have to perpetually learn new material, it’s huge. 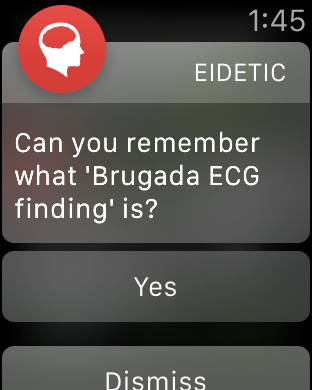 So you can understand why I was excited that there is a spaced repetition Apple Watch flashcard app — it’s called Eidetic, and currently the only flashcard app that is available for the Apple Watch that utilizes spaced repetition. As much as I love using Anki on my iOS devices, I don’t always have my phone on me, and I don’t check it for all the notifications I receive. 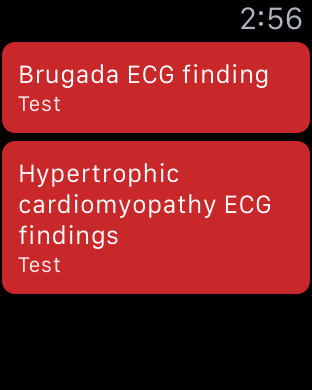 I have my Apple Watch set to only a few notifications from a few apps since it’s always on, and having a spaced repetition app is great for this. I get spaced notifications about flashcards I have made, and I don’t have to pull out my iPhone to review them. There are some issues with this app though, and it centers more around data input. You can use the app on all your iOS devices, but there is no backend portal from which you can input your flashcards. This is a big deal since it’s cumbersome to input flashcards on your iPhone or iPad — the most ideal way to input data is with your desktop computer. 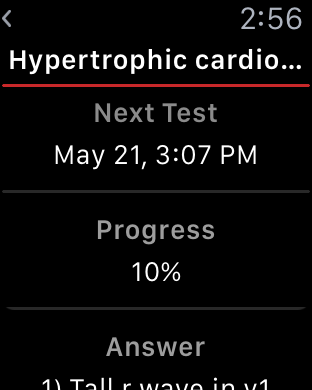 So the Eidetic app and its accompanying Apple Watch app have not replaced the AnkiMobile Flashcards app I use for my iPhone, but it’s a great adjunct app for memorizing content. If there are a few things you want to memorize at a time that don’t contain a great deal of text, inputting them into the Eidetic app works. Further, you’re able to save to Evernote, so if you want to add the flashcard to your Anki deck it’s easy to copy and paste from your desktop’s Evernote app. 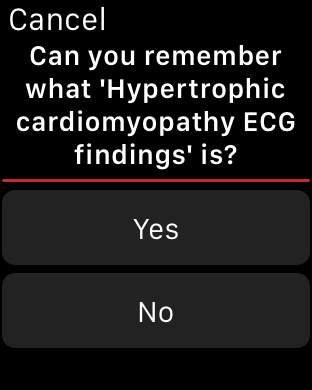 Having the ability to use spaced repetition on the Apple Watch is a game changer since you always have the watch on you, and will get spaced reminders on your Watch that you can act on more quickly than your phone. Integrates with Evernote (Doesn’t let you pull content from Evernote, but the cards you make within the app can be saved to Evernote). Doesn’t give the ability to add multiple choice questions. Doesn’t have a web portal, this hurts because it’s cumbersome to type a lot of content on iOS devices into the app. Doesn’t let you pull content from Evernote. 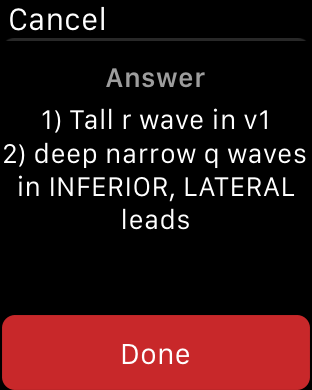 If you’re a fan of spaced repetition memorizing and you have the Apple Watch, this is a great app to use. It dramatically improves the overall utility of your Apple Watch as well. 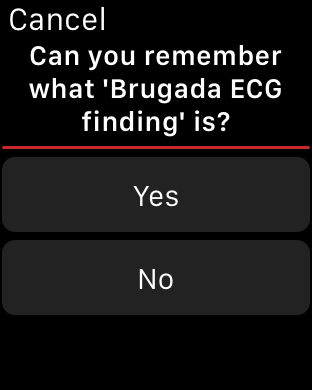 As I mentioned earlier though, this app is an adjunct, and won’t replace Anki since it doesn’t have a web portal to easily input medical content. Would have liked the ability to add pictures to question answers. Can’t be used by medical professionals as a singular tool for spaced repetition learning, but definitely useful as an adjunct. Ohh, you’re going to tempt me back to Apple! Looks fantastic, and would be able to extract incredible value with the odd few seconds here and there. Adding up over time would be a hell of a lot of potential. I know right! My only issue is the input method really needs some help right now. If they even had the ability to import notes from Evernote that would be awesome.